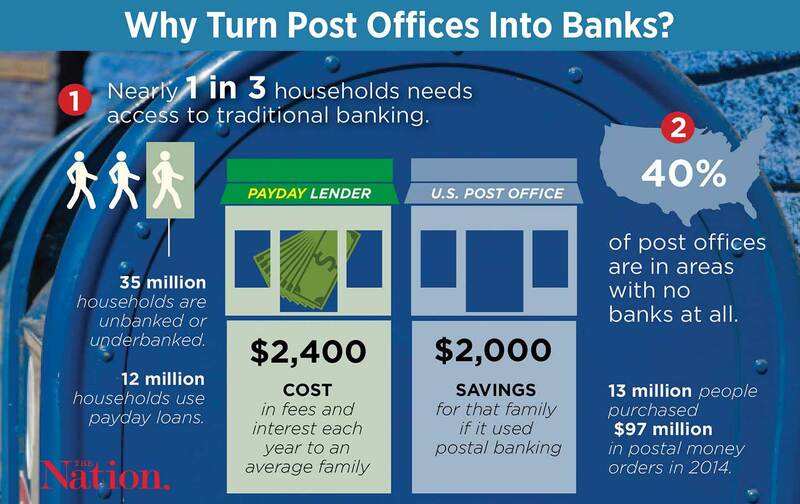 We could save Americans millions with postal banking. Nine years ago, a Harvard law professor dreamed up a new concept: a government agency devoted solely to protecting consumers from unscrupulous financial companies, the way the Consumer Product Safety Commission protects us from faulty microwaves. Today, Elizabeth Warren’s Consumer Financial Protection Bureau (CFPB) is in full effect, and has already netted Americans about $10 billion in remedies from banks since it started its watch. One financial product remains in the shadows, however, preying on consumers: payday lending. The very same CFPB just announced rules to regulate the industry, proposing that lenders be required to verify whether customers have any chance of repaying what they borrow and limiting how many times a borrower can roll over loans while accruing interest and fees. But the CFPB’s powers are also limited—it can’t cap interest rates, which frequently soar to 400 percent, or restrict access to these short-term loans. Meanwhile, too many Americans who can’t afford the minimum deposit necessary for a traditional banking account, or who don’t live near branches or simply don’t trust banks, have nowhere to turn but to payday lenders and other kinds of risky, expensive products. It may sound odd, but the Postal Service could easily get into the banking business. Elizabeth Warren has a new crusade, though, and it could fill that vast void: postal banking. Nearly 10 million households qualify as “unbanked,” meaning they don’t have any traditional banking products such as a checking account. Another 25 million are “underbanked,” meaning they have an account but still turn to payday loans or similar products. Together, these two groups comprise nearly a third of all households in the country. The so-called alternative products they rely on—payday loans, prepaid debit cards, check-cashing services—cost them almost $90 billion a year in interest and fees, or an average of about $2,400 per family. The United States Postal Service would be a much friendlier lender. If the USPS were to offer debit cards, savings accounts, and small-dollar loans, it could save the average underbanked family more than $2,000 a year. Even if just a tenth of the 12 million people who take out payday loans every year instead got a small loan from the post office, they would save more than half a billion dollars. This notion might sound odd, but it doesn’t take much imagination to see how the post office could get into the business. The USPS already has a large footprint, with more than 30,000 locations across the country, including small towns and rural areas; nearly 40 percent are in places without any bank branches. The post office also offers money orders and prepaid debit cards through American Express: In fact, it sold 97 million money orders in 2014, to about 13 million people. We even had a rudimentary postal-banking system in the past. Between 1911 and 1967, the USPS operated a postal savings system that let people make deposits at certain locations. At its peak, more than 4 million people were using it, having deposited a collective $3.4 billion. Plus a number of other countries, from France to New Zealand, offer banking services through their post offices. Customers wouldn’t be the only beneficiaries. Congress has pushed the USPS into a precarious financial situation, and postal banking represents a billion-dollar opportunity. Even if just 10 percent of the money spent on alternative financial products went to postal offerings instead, the USPS could see nearly $9 billion more in revenue each year. Warren just helped launch “Take On Wall Street,” a coalition of lawmakers, labor leaders, and advocacy organizations that seeks to reform the country’s banks. One of the coalition’s most prominent planks demands the creation of a postal-banking system. Nor is Warren the only high-profile politician backing the idea: Democratic presidential candidate Bernie Sanders included it in his own plan to overhaul Wall Street. But if Warren decides to fight for postal banking the way she did for the CFPB, the flow of money out of millions of Americans’ pockets and into predatory lenders’ coffers may someday soon be stanched.